If you are in Year 12 at one of SA’s rural high school and thinking of studying medicine, RDWA’s university preparation grant can help you reach your goal. 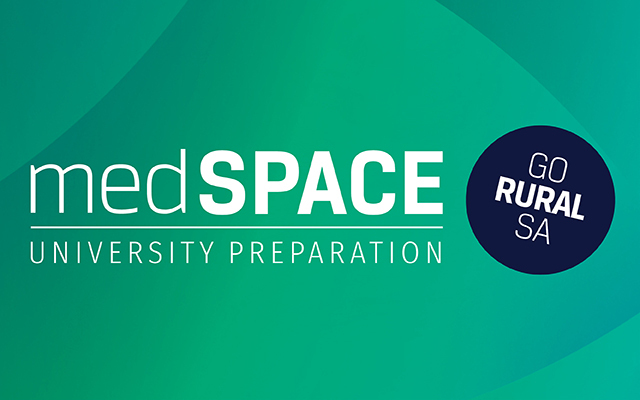 The medSPACE University Preparation Grant will help you prepare for the University Clinical Aptitude Test (UCAT), identify the key dates you’ll need to know; and learn new skills that will help for interviews that can be part of the university’s entrance process. interview skills workshops and on-line videos. Who is eligible to apply for the grant? Year 12 students studying at a rural high school in South Australia are eligible to apply. A rural high school is located in a town that is in the classification level 2-7 of the Modified Monash Model (MMM). If you would like to check if your town is in MMM 2-7, please use the ‘Search the Maps’ section of the doctor connect website http://www.doctorconnect.gov.au/ and choose the Modified Monash Model filter. What do I need to do to receive the grant? If you think your town is an eligible location, please fill in the application form with your Parent or Guardian using the APPLY button below. You and your parent will need to print and sign the form and either upload it or post it to us using the post free address. When you complete the form, you and your parent will be asked to agree to tell RDWA if you applied to university and if you were successful in being offered a place in any of the courses you applied for. This is the only obligation on you. Our Future Workforce Team will confirm that you are studying Year 12 at an eligible location, and if we don’t have all the information to assess this, we will contact you and your parent to ask for more information. Once we have been able to assess your application, we will let you and your parent know by email whether you have been successful. If you have not been successful, we will tell you why not. If you are offered a grant, you will be asked to accept the grant and confirm that you will provide us with the information later in the year about the courses you applied for and whether you have been offered a place at a university next year. Once you have accepted the grant, we will provide you with a package of information about the online UCAT learning and the workshop options in Adelaide. You and your family will then be able to decide if you want to attend a workshop and you and your family will be able to make the arrangements to attend the workshop with MedEntry. MedEntry is the company that provides the UCAT workshops and on-line learning for medSPACE. You will need to make your own arrangements for travelling to and from the workshop, and for any overnight accommodation. We will make a contribution of $150 toward the costs of travel and accommodation if you chose to attend the workshop. Our Future Workforce Team will provide you more information about how to apply to Flinders University or Adelaide University for their medicine courses and we will link you directly to the university’s information for their course. We will start sending you information about key dates so you and your family can put them in your diaries; and we will let you know more about the Interview Skills activities later in the year. Call or email our Future Workforce team anytime.